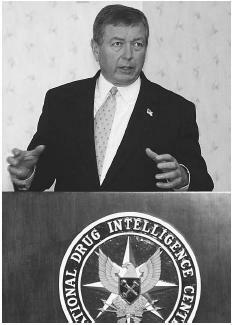 Attorney General John Ashcroft, speaking at a news conference at the National Drug Intelligence Center in Johnstown, Pennsylvania, in August, 2002, said that the technology now being used to combat illicit drugs has also proven useful in tracking the movement of terrorist groups. intelligence community. Created in 1993, it is responsible for providing national leadership as well as law enforcement officials, with a strategic picture of the traffic in illegal drugs throughout the United States. It offers its client base a number of intelligence products and services, including information provided by its Document Exploitation Division. NDIC products and services. Principal among NDIC's intelligence products are its threat assessments, of which the most significant is its annual National Drug Threat Assessment. The latter identifies principal drug threats, provides data on changes in consumption patterns, analyzes the availability of drugs by geographic market, and tracks patterns of distribution and trafficking. NDIC also creates drug threat assessments by state, and issues information bulletins in response to drug-related issues as those arise. The Intelligence Division of NDIC includes six geographic units, as well as four units with specialized tasks. These are the Drug Trends, Organized Crime and Violence, National Drug Threat Assessment, and National Interdiction Support units. Some information comes to NDIC by means of field program specialists, whose position was created by a January 2001 initiative intended to encourage sharing of information among law-enforcement officials at the federal, state, and local levels. Field representatives are independent contractors, usually with years of experience in drug law enforcement. NDIC's Document Exploitation Division analyzes information seized in major federal drug raids or investigations. Document Exploitation teams make use of proprietary software known as the Real-time Analytical Intelligence Database, or RAID. RAID allows agents to process massive quantities of information from seized documents and computers. The program collects, collates, and labels large information packets, then subject this data to intensive analysis in a search for hidden information on assets, associates, and other valuable leads. The center also provides counterdrug analysis training courses for personnel in local, state, and federal law enforcement agencies. This education program is a cooperative effort of NDIC and the Federal Bureau of Investigation, Drug Enforcement Administration, National Guard Bureau, U.S. Customs Service, and Financial Crimes Enforcement Network. In performing its overall mission, NDIC works closely with these agencies, as well as with the U.S. Coast Guard, the Bureau of Alcohol, Tobacco, and Firearms, the Bureau of Prisons, and the Office of National Drug Control Policy. Strong, Ronald L. "The National Drug Intelligence Center: Assessing the Drug Threat." The Police Chief 68, no. 5 (May 2001): 55–60. National Drug Intelligence Center. < http://www.usdoj.gov/ndic/ > (February 23, 2003). National Drug Intelligence Center. Federation of American Scientists. < http://www.fas.org/irp/agency/doj/ndic/ > (February 23, 2003).